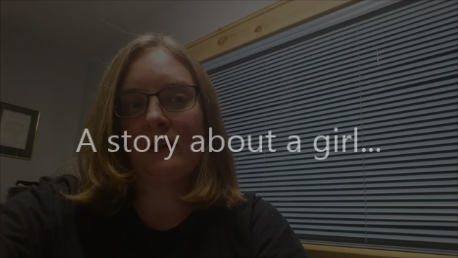 I would like to tell you a story about a girl. A girl who loved both science and math. She grew up in a family that didn’t define jobs or tasks by gender. She really believed she could be whatever she wanted when she grew up – it didn’t matter that she was a girl. It wasn’t until she was in high school, that she had her first experience with gender bias. It was chemistry class, “killer chem” as it was called. But despite its reputation, it turns out she really liked chemistry and she was good at it. It was near the end of the semester, a time when students start thinking about what classes they want to take the following year. She knew she would take the next chem class. It was a no-brainer… to her. The teacher of that chemistry class went around the room to discuss course registration with each student. Each time he spoke to a girl, you could overhear things like, chemistry may be too challenging, or biology would be a better choice, it’s easier. When it was her turn to listen to his words, he said how surprised he was that she had done so well in his class. Perhaps she should consider the next chem class. He was truly dumb stuck that she could do THAT well. Why? Did he know something that she didn’t? Maybe she shouldn’t have been taking chemistry? Was it just for boys? For the first time she had doubts about her academic, and life choices. Despite these doubts, she went on to take chemistry, and biology and physics and calculus and algebra. And she did very well. Was this expected? She went on to university to continue learning. She was fortunate to have many inspiring professors and mentors, both male and female, throughout her undergraduate degree. In fact, some of the most memorable moments came in the classes taught by her female professors. If gender bias existed, she never felt it as an undergrad. She was very lucky. She knows that now. She graduated with distinction with a degree in biochemistry. Yes, she had continued in a field of chemistry despite that little voice in the back of her head telling her that she had no place being there. She went on to graduate school. She worked in a lab filled with strong men and women. She was too busy with her research, her thesis to worry about being a girl. Then she attended her very first scientific conference. Scientists from all over the world were there. It was all very new and exciting, and yes, it was scary to present her work on this very large stage. But as she sat in scientific talks, listened to keynote speeches, and toured the halls of the conference center she noticed, for the first time, that she was surrounded by very few women. It was the first time she felt like a minority. Where were all the women? But, like always, she stashed that thought away and continued with her work. She went on to win many academic awards, and scholarships. She published her research, with some appearing in high powered scientific journals. She was recognized by her peers, she was now a real scientist. A scientist who just happened to use the ‘she’ pronoun. Somewhere along the way, she discovered her passion for teaching was too strong to ignore. And now, she shares her knowledge and experiences with others in the classroom. She remembers teaching a recent class, and looking around the room before lecture began, truly awed by the brilliant minds in that room. Aspiring men, and women all with beautiful futures. She felt a true honour to be part of their journey. As her last lecture approached, a few students, all women, came to thank her for being a strong, inspiring FEMALE professor. For many, she was their first and only they had seen in their degree. That moment, plus those she had had in that chemistry class as a teenager and at her first scientific conference as a young adult, those moments now make her feel uneasy. And she wonders, how many girls were told that science is too tough and listened and then walked away. How many were discouraged from following their dreams because of their gender or some other box that they happen to check. If she had not been wearing her gender blinders most of her life, would she have had the honour of standing in front of these amazing classrooms filled with students hungry for knowledge? That girl… was me. And today, I know that it is important to encourage not discourage our youth, our children. All of them. I am lucky. I know that now.